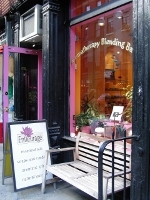 Was it really six years ago that I wrote a shopping report about Enfleurage, New York’s most specialized purveyor of natural aromatics? Yes, apparently. The boutique has since moved to a new address (237 West 13 Street, in Manhattan’s Chelsea neighborhood) but its staggering selection of essential oils and natural incenses remains unchanged. 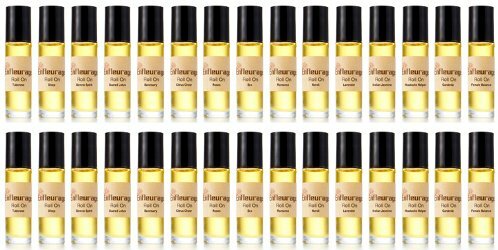 I still sniff individual oils during each of my visits, but I’m also very fond of Enfleurage’s “house blends.” They’re available as concentrated oils and as “roll-ons to go,” diluted in a base of organic jojoba oil for ready-to-wear use. Enfleurage is the kind of shop that seems somewhat endangered on the streets of Manhattan’s West Village these days: intimate, independently owned, and quirkily specialized in its merchandise. If you’re walking past its open door, you might be lured in by the colorful focal point of brightly tinted and patterned soaps arranged on a central table. Once you’re inside, you’ll realize why this business is particularly well known for its selection of essential oils, which the owner of Enfleurage has gathered from locations around the world.